An animation of the unwrapping of a catalse-coated flower-like sheet around a capsule. Black arrows indicate the directionality and magnitude of the flow field in the solution. 04-Jan-2019: The "magic carpet" featured in tales from "One Thousand and One Nights" to Disney's "Aladdin" captures the imagination not only because it can fly, but because it can also wave, flap, and alter its shape to serve its riders. 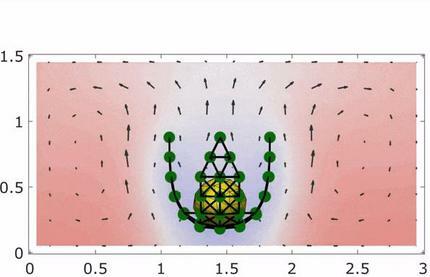 With that inspiration, and the assistance of catalytic chemical reactions in solutions, a team from the University of Pittsburgh's Swanson School of Engineering has designed a two-dimensional, shape-changing sheet that moves autonomously in a reactant-filled fluid. "It's long been a challenge in chemistry to create a non-living object that moves on its own within an environment, which in turn alters the object's shape, allowing it to carry out brand new tasks, like trapping other objects," Dr. Balazs explained. "Researchers previously have made chemically active patches on a surface that could generate fluid flow, but the flow didn't influence the location or shape of the patch. And in our own lab we've modeled spherical and rectangular particles that can move autonomously within a fluid-filled microchamber. But now we have this integrated system that utilizes a chemical reaction to activate the fluid motion that simultaneously transports a flexible object and "sculpts" its shape, and it all happens autonomously." The group accomplished this feat of self-propulsion and reconfiguration by introducing a coating of catalysts on the flexible sheet, which is roughly the width of a human hair. The addition of reactants to the surrounding fluid initiates both the carpet's motion and the changes of its form. "To best of our knowledge, this is the first time these catalytic chemical reactions have been applied to 2D sheets to generate flows that transform these sheets into mobile, 3D objects," Dr. Balazs said. Further, by placing different catalysts on specific areas of the sheet and controlling the amount and type of reactants in the fluid, the group created a useful cascade of catalytic reactions where one catalyst breaks down an associated chemical, which then becomes a reactant for the next of the set of catalytic reactions. Adding different reactants and designing appropriate configurations of the sheet allows for a variety of actions - in this study, enwrapping an object, making a flapping motion, and tumbling over obstacles on a surface. "A microfluidic device that contains these active sheets can now perform vital functions, such as shuttling cargo, grabbing a soft, delicate object, or even creeping along to clean a surface," Dr. Shklyaev said. "These flexible micro-machines simply convert chemical energy into spontaneous reconfiguration and movement, which enables them to accomplish a repertoire of useful jobs." Dr. Laskar added that if the sheet is cut into the shape of a four-petal flower and placed on the surface of a microfluidic device, the chemistry of the petals can be "programmed" to open and close individually, creating gates that perform logic operations, as well as generate particular fluid flows to transport particles throughout the device. "For example, like a catcher's mitt you can use the petals of the flower to trap a microscopic ball and hold it for a finite time, then initiate a new chemical reaction on a different set of petals so that the ball moves between them in a chemically-directed game of catch," Dr. Laskar explained. "This level of spatial and temporal control allows for staged reactions and analyses that you otherwise couldn't perform with non-deformable materials." "This research gives us further insight into how chemistry can drive autonomous, spontaneous actuation and locomotion in microfluidic devices," Dr. Balazs said. "Our next task is to explore microfabrication by using the interaction and self-organization of multiple sheets to bring them together into specific architectures designed to perform complex, coordinated functions. Also, by experimenting with different stimuli such as heat and light, we can design mobile, 3D micro-machines that adapt their shape and action to changes in the environment. This level of responsive behavior is vital to creating the next generation of soft robotic devices."